Most organisms have evolved circadian clocks to anticipate environmental changes associated with the 24h night-day cycle of earth rotation. Circadian clocks modulate rhythmic expression of a large number of genes and thus generate the potential to control biochemical, physiological and behavioral functions in a time-of-day specific manner. Circadian clocks are cell-autonomous oscillators. Eukaryotic circadian clocks are composed of a network of interconnected positive and negative feedback loops that produce rhythmic expression and modification of one or more clock proteins. Circadian oscillations are self-sustained and persist without environmental cues with a ca. 24 h period. In nature, environmental signals, so-called zeitgebers, are transduced to the circadian clock to synchronize the clock with the 24 h period of earth rotation. The strongest zeitgebers are light, temperature and nutrients. Using the filamentous fungus Neurospora crassa as a model organism, we aim to understand how the circadian clock works as a program that coordinates complex expression profiles in a temporal fashion. The frequency (frq) gene is a key element of the circadian clock of Neurospora. Expression levels of frq RNA and FRQ protein oscillate in a circadian fashion. 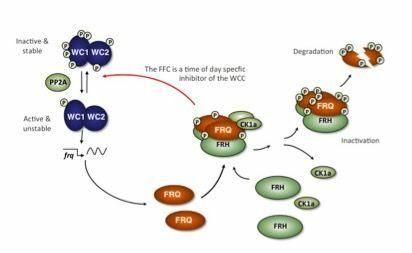 Expression of frq is controlled by the heterodimeric transcription factor White Collar Complex (WCC), which activates clock-controlled frq transcription. FRQ assembles with casein kinase 1a (CK1a) and FRQ-Interacting-Helicase (FRH) forming the FFC complex. FFC is a scaffold that interacts transiently with WCC. It inactivates the transcription factor via phosphorylation by CK1a and thereby inhibits synthesis of frq RNA and FRQ protein in a negative feedback. In the course of a day FRQ is progressively hyperphosphorylated. Hyperphosphorylated FRQ releases CK1a. It is then functionally inactive and degraded, resulting in relieve of the negative feedback. The circadian clock and the cell cycle are major cellular systems that organize global physiology in temporal fashion. The circadian clock of mammals is constituted by the core transcription factor BMAL1/CLOCK, which rhythmically activates expression of clock genes including CRYs, PERs, REV-ERBs, and RORs. CRYs and PERs are inhibitors of CLOCK/BMAL whereas REV-ERBs are repressors that control in coordination with ROR activators expression of BMAL1 and CLOCK. The D-box-specific transcription factors E4BP, DBP, TEF and, HLF additionally contribute to the regulation of specific clock genes. Disruption or misalignment of circadian rhythms in humans has been associated with numerous pathological conditions including cancer. MYC is an oncogene, which is severely deregulated in different cancers and, amplification of MYC often correlates with tumor aggression and poor prognosis. MYC is a transcription factor that supports cell growth and proliferation (cell cycle progression) by regulating transcription of up to 15% of the transcriptome. 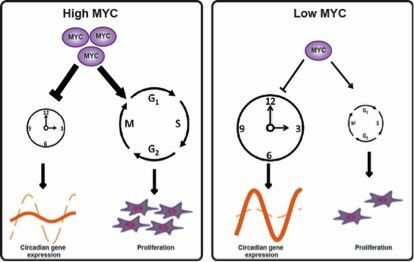 MYC is a key regulator that coordinates the circadian clock with cell growth. Overexpression of MYC attenuates the clock and conversely promotes cell proliferation while downregulation of MYC strengthens the clock and reduces proliferation. Inhibition of the circadian clock is crucially dependent on the formation of repressive complexes of MYC with MIZ1 and subsequent downregulation of the core clock genes BMAL1 (ARNTL), CLOCK and NPAS2. BMAL1 expression levels correlate inversely with MYC levels in 102 human lymphomas. mRNA transcripts are often present at only a few copies per cell and many genes are transcribed in bursts, with brief periods of high activity interspersed by long periods of inactivity. Burst size, i.e. the number of transcripts per burst, and burst frequency, i.e. the number of transcriptional bursts per time unit, are gene-specific and appear to depend on the promoter architecture. We use the natural light-inducible gene expression system based on the transcription activator and blue-light photoreceptor White Collar Complex (WCC) of Neurospora crassa. The system allows repetitive stimulation of transcription within a short period of time. 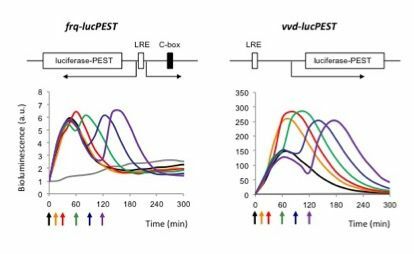 Activation of WCC by a single short light pulse (LP) triggers a synchronized wave of transcription at a large number of promoters. 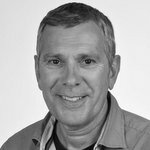 We have observed burst sizes between one and more than 50 transcripts per burst followed by periods of inactivity in the range of hours. Challenging the frequency (frq) promoter with consecutive light pulses revealed that the promoter supports transcription of ~1 mRNA molecule and then becomes refractory towards further activation for about 45 min. This negative transcriptional memory is dependent on slow chromatin remodelling of the core promoter. Activation frq and vvd promoters by a single LP at t=0 min (black arrow, black curve) or restimulation by a 2nd challenging LP after 15, 30, 60, 90, and 120 min (colored arrows and curves).